We’re ready to ring in 2017 with this traditional New Years Day dish. Hoppin’ John has southern roots, and is a perfectly savory way to start a new year, and bring yourself a little good luck! 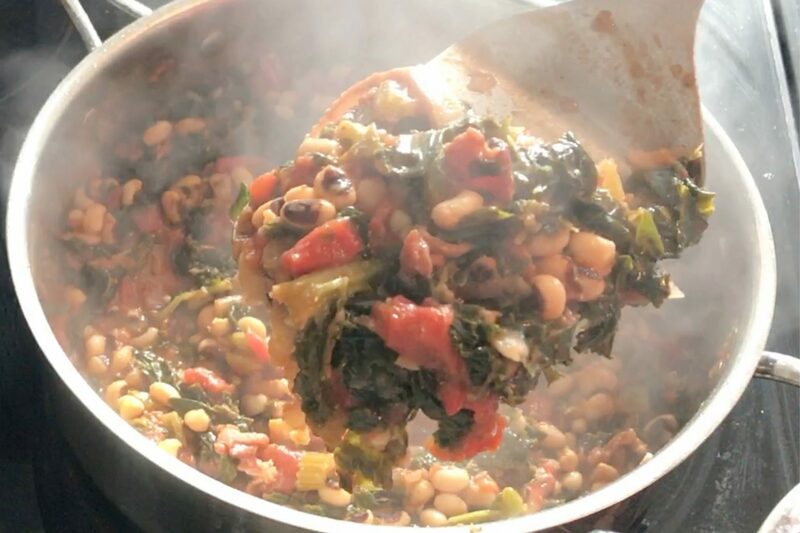 They say that black eyes peas and greens bring financial prosperity and good fortune in the coming year when eaten on January 1st. We love any excuse to eat good food, especially with a side of prosperity. This twist on the traditional Hoppin’ John is quick and easy! Start by soaking black eyed peas overnight by placing them in a bowl with water and covering before bed. Heat some oil over medium-high heat in a pan. Add chopped celery, onions, and bell peppers. Add 2 cups of soaked black eyed peas. Add 2-3 cups of broth. Bring to a boil, reduce heat to a simmer, cover and let cook. Stir occasionally. About halfway through cooking, add a few handfuls of fresh kale, cover and let wilt. Stir kale into black eyed pea mixture. Allow all excess liquid to cook off. Serve alone, or over brown rice or quinoa. Enjoy!